Successfully Added Mouse Skype Phone to your Shopping Cart. New totally useful computer gadget - Skype Phone + Mouse all-in-one computer accessory. 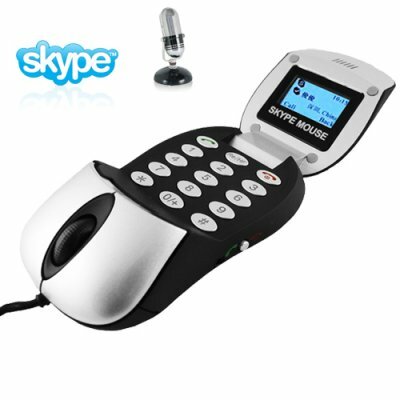 This Wholesale Mouse Combo features a VoIP Skype Phone and a fully functional mouse for convenience and for fun. Plug this into your computer, and see how a great add-on product this can be for your laptop and netbook computer. Now you have a fully functional mouse that can also be used as a microphone and speaker when you want to make VOIP calls or chat. With always available warehouse stock and fast delivery, this Made in China Computer Accessory is a perfect drop shipping item or gift for yourself since you we will ship it out within 24 hours. Click "add to cart" to order yours now. Included disc with VOIP software is not needed to use the mouse. The installation of software is purely optional. More current versions of each VOIP software can be found on the internet.